The leader of the Indige­nous People of Biafra, Mazi Nnamdi Kanu has declared that the anger of his god will de­scend on the people of Anambra if they went ahead to participate in the November 18 gubernatori­al election in the state. Kanu made the controver­sial proclamation when he ad­dressed his supporters at Nri, the ancestral home of Igboland, in Anocha Local Government Area of Anambra State, on Tues­day. Meanwhile, heads of securi­ty agencies in Anambra have urged citizens of the state to ig­nore the threats by IPOB as they have no powers to stop the con­duct of the election. They insist that they are ready to police the state and ensure that the elec­toral process was not disrupted. The tough-talking IPOB boss, who sneaked into the ances­tral town with his wife, Uche­chi Kanu insists that Anambra governorship election will not hold unless the acting President, Professor Yemi Osinbajo declares the date for the referendum. According to the Abia-born activist, the only way Biafra in­dependence can be actualised is for Igbos to boycott all elections conducted by the Nigerian gov­ernment in the South East geo­political zone (Biafraland). He insists that anybody that defies the boycott order issued by IPOB leadership in Anambra and oth­er states in the region will have himself to blame. “Anybody that stands in the way of Biafra will be destroyed. I have not made any pronounce­ment that did not come to pass. I am saying that there will be no election in Anambra State on No­vember 18. “Nobody can stop IPOB. Bi­afraland is grossly marginalised; we have no good road, no elec­tricity, no source of water and so on. I am sure that Buhari will not come back again and if anybody said there will be no Biafra, what happened to Buhari will happen to the person,” he warned. Kanu had earlier paid a cour­tesy visit to the Nri king maker, Chief Shedrack Mbanefo (Adama Nri) who prayed for him and as­sured him of Igbo support for the struggle for the actualisation of Biafra. 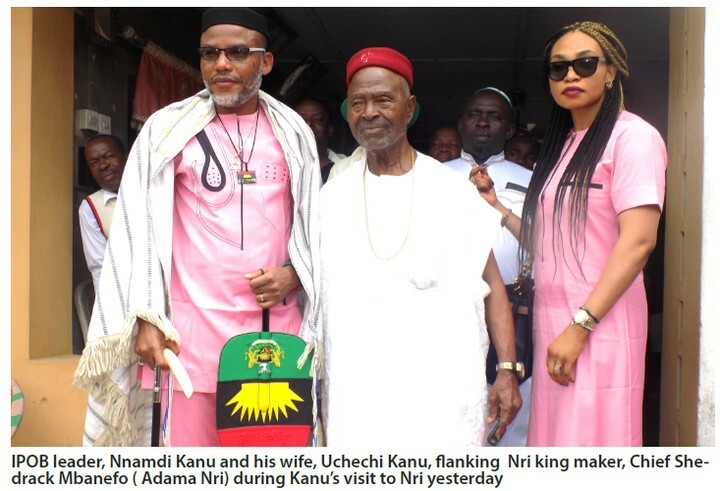 “Kanu’s visit to the ancestral home of Adama Nri is a mystery and spiritual and this is an indi­cation that Biafran sovereignty will be achieved. May God con­tinue to bless him and his fam­ily as he champions the Biafran course,” he prayed. Kanu, accompanied by Ad­ama Nri and other elders of Nri community later trekked to Nri garden of Eden, regarded as evil forest, where he engaged in a brief prayer session and sought the blessing of the gods for the Biafran freedom campaign. While Kanu was at Nri, urging Anambra citizens to shun the November poll, the state securi­ty chiefs in Awka issued a stern warning to the group and other trouble makers to desist from acts capable of jeopardizing the success of the poll. A joint security task force meeting which involved the Ni­gerian Army, Navy, Police and the National Security and Civ­il Defence Corps (NSCDC) as well as the National Drug Law Enforcement Agency (NDLEA) insists that the crucial governor­ship election would take place as planned. In a statement issued after the meeting, the security chiefs urged members of the public, es­pecially residents of Anambra to disregard the pronouncements by the IPOB leader and his co­horts, and go about their lawful businesses. Anambra Police Commission­er, Garba Baba Umar, who spoke on behalf of the security chiefs, assured of their readiness to protect lives and properties of citizens as well as ensure that the election was conducted in a peaceful, free and fair manner. According to him, security agencies are putting in place measures that would forestall unlawful breakdown of peace and order in the state and nip in the bud any attempt by some misguided elements to dis­rupt the poll in line with IPOB’s boycott agenda. Umar adds: “This is unaccept­able and would not be tolerated in the state as the command and other security agencies respect the rights of individuals to freedom of expres­sion and peaceful assembly”.